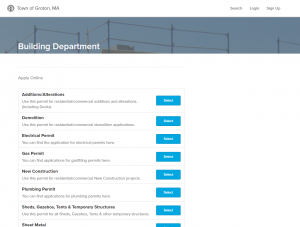 Most of our traditional Building Permits are all done online now. You can apply from any device that has an internet connection, computers, phones, tablets, etc. Our online process will take you through the submission of your permit (with documents), approval, payment, inspections, and finalization. You can access our online permitting by visiting https://grotonma.viewpointcloud.com/ . If you are unable to access the online building permits you are welcome to come into Town Hall and use a kiosk computer in our building department. If you have any questions about the permit process do not hesitate to contact the Building Department for assistance.